Zohreh Ghaemi was born to a middle-class family in Tehran in 1964. Because of a family relationship with Saeed Mohsen, one of the founders of the opposition People’s Mojahedin Organization of Iran (PMOI/MEK), Zohreh became politically active at an early age. When she was only 12 years old, she began reading the biographies of Iranian freedom fighters and gradually became acquainted with the PMOI and its goals and aspirations for a free Iran. Zohreh actively participated in the 1979 anti-monarchical revolution. When she was only 14, she took part in protests and marches in Tehran. Later that year, she joined the supporters of the PMOI in her high school and stepped up her social activism. Zohreh was arrested during an early 1981 street protest against the clerical regime’s measures curtailing new-found freedoms. Though only 17 years old, she was transferred to Ghezel Hessar Prison, to the solitary confinement ward known as Unit 8, infamous for its extreme punishing measures. Even though Zohreh was supposed to be freed in 1984, she was kept imprisoned for another two years only because she refused to participate in a mock interview against the PMOI. She was eventually released in 1986. Later that year, she joined the ranks of the PMOI in Camp Ashraf to continue her fight for freedom of her people. At Camp Ashraf, Zohreh quickly proved her competence and rose through the ranks of the movement. She assumed increasingly challenging responsibilities, became a member of the PMOI Leadership Council and a high-ranking commander of the National Liberation Army of Iran (NLA). Owing to the prudence and leadership of women such as Zohreh Ghaemi, the PMOI stood firm for 14 years at camps Ashraf and Liberty in the face of the regime’s barbaric siege, attacks, and psychological torture. Zohreh was always at the forefront and proved her competence in handling extreme difficulties with dedication to the resistance and cause of freedom. Zohreh was targeted on July 28, 2009, and wounded in the thigh when shot by Iraqi forces who had attacked Camp Ashraf at the behest of the Iranian regime. Although she went through a number of painful and difficult surgeries, Zohreh was always calm, firm and smiling, inspiring resilience and hope in her fellow comrades. In September 2011, Zohreh was elected Deputy Secretary General of the PMOI. 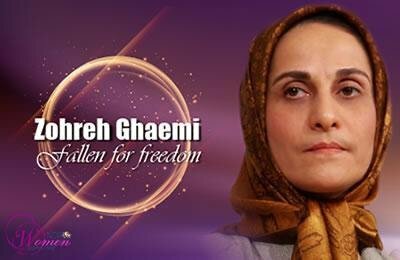 The most brilliant chapter in Zohreh Ghaemi’s life was when she undertook the responsibility of commanding the group of 100 PMOI members who had to stay in Ashraf, after the residents’ relocation to Camp Liberty, to protect their properties until final disposition. Those two years in 2012-2013 required utmost readiness for the ultimate sacrifice including becoming a victim of kidnapping, torture, or martyrdom at the hands of the forces of Iraqi Prime Minister Maliki, a puppet of the Tehran regime. Finally, on September 1, 2013, Zohreh Ghaemi and 51 of her comrades were massacred by special forces who attacked the defenseless residents of Ashraf, at the behest of Khamenei. These 52 men and women of the Iranian Resistance are gone—and thousands of other freedom-loving Iranians are gone, killed by the rule of the Supreme Religious Leader. But you can’t kill the dream of freedom. The vision for a free Iran lives on. These 52 men and women showed the world, and in particular, the millions of young people in Iran that it is possible to live a life with dignity, freedom and courage. These leaders have died, but somewhere in Iran—or maybe in this very room—their replacements have been born. The vision will live on until it is achieved.